Running on word of mouth? Congratulations. You have created a culture where people are happy to refer you to their family and friends, and that keeps the phone ringing. But you don’t have a business. YOU are the goodwill of the business. But you are also the weakest link (goodbye). If you don’t pay for customer acquisition, you don’t have a real business. Not one you can sell, anyway. Maybe you don’t plan on ever selling your business. That’s fine. Paying to acquire customers (aka marketing) means that you can figure out what works, and what gives you the best return on investment, and then you just do more of that. Maybe you don’t know what gives you the best return on your investment. If you’re not tracking every pound and making it work for you, then you could be throwing away a huge amount of money on marketing that just doesn’t work. I recently had a Power Day with a great, independent agent looking to grow her business. Let’s call her Maria. 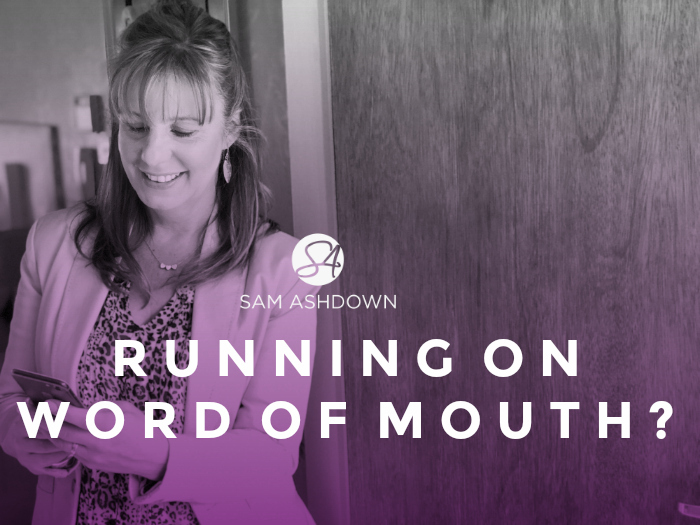 We met at a hotel in York and spent the day analysing her current marketing spend: where it was going, and what it was bringing in. This gave us cost per market appraisal booked of £60. These benchmark then allowed Maria to look at all her marketing activities again, holding each one to account for the £60 cost. As her newspaper annual spend is currently £2000, it should generate at least 33 market appraisal each year, to break even. But it’s not. Maria doesn’t know exactly how many opportunities to value come into the office as a direct result of her newspaper advertising, but she’s pretty sure it’s not three a month. We did debate the merits of newspaper advertising as an instruction-winning tool, but she admitted that it’s something vendors don’t seem particularly impressed by in her area, particularly as her main market is aspiring families, who are digitally savvy and tend not to read the local paper. When we examined her leafleting spend, it was a different story. This is a figure she does track, and she could tell me that her annual spend of £2800 resulted in over 80 enquiries last year – that’s only £35 per enquiry – a big improvement on £60. This means that her newspaper ad spend is pushing up her average cost per market appraisal by nearly 60%. Maria was pretty shocked by this. Together, we analysed all her marketing spend, in detail, all the while using the £60 per market appraisal as a benchmark to decide whether to stick with that particular activity, or ditch it. For the first time, Maria was making sure every pound spend on marketing was justified. If, for example, each marketing activity generated market appraisals at a cost of only £35, instead of £60, her current yearly marketing spend of £14,000 would produce 400 appointments, instead of 233. Let’s dive even deeper into the implications of this improvement. Now let’s run these figures again on 400 valuation appointments. That’s a 58% uplift in revenue, from the same marketing spend. Of course, this assumes that Maria can replicate her canvassing cost per market appraisal in the other areas of her marketing, but even if she used leafleting as her only source of marketing, increasing the quantity until her marketing spend was used up, she would still see a significant increase in market appraisals. Holding your marketing pound to account is something I rarely see amongst agents; even the good ones engage in ‘brand awareness campaigns’, or as I like to call it, ‘ego marketing’. Buy response – never buy brand awareness. If you’d like to know more about how my Power Day could help you get through more doors, Tell me a bit about your businesss here and let’s see if it’s a good fit.